Functional, versatile and beautiful accent chair is the perfect addition to any space. It will spice up any living environment with qualities of sophistication, class and taste. Soft angles and unique curved metal base design come together in a seat that is smartly aesthetic and ready to grace your cozy living room. Featuring buttery soft velvet upholstery and high density foam cushioned seat, this elegant accent piece provides both functionality and a focal point of color and style that seamlessly blend harmoniously with your main furniture to create a dynamic and cozy interior space to come home to. 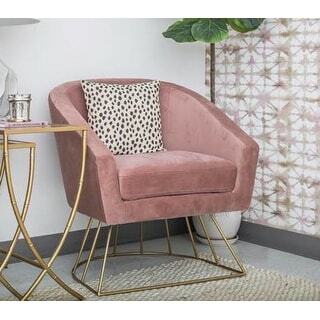 MODERN DESIGN - With its curved metal base concept, this chair in modern and chic velvet upholstery adds a touch of freshness to your home decor. 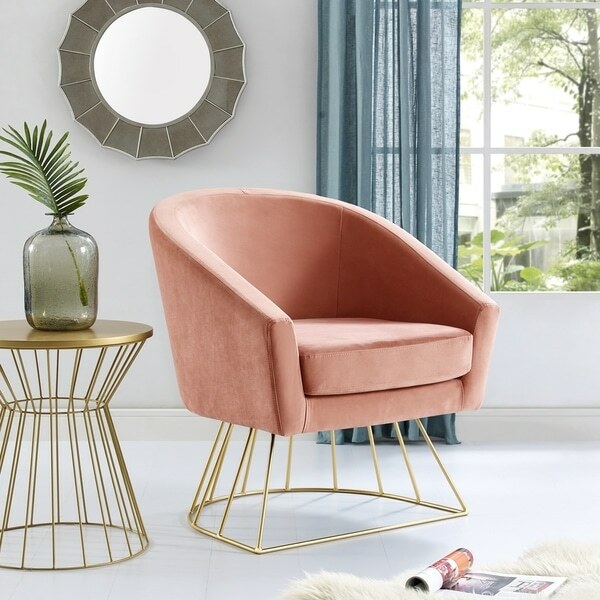 VERSATILE USE - Accent chair provides extra seating with an elegant look that can fit into any room: bedroom, living room, dining room, entryway, also blends with a variety of decor. MULTI-FUNCTIONAL - Can be used in multiple room settings: as a vanity chair, dressing chair, accent chair. CUSHION SEAT - Pocket Box spring seat with removable seat cushion. Dimensions 27.4 In. X 28.9 In. X 32.7 In. I love the chair. A little smaller than I thought it would be but it's comfortable to sit in and works well in the living room. 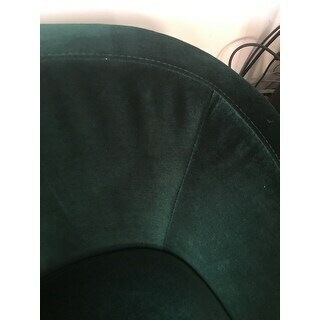 While the chair is very pretty it isn’t even close to navy blue. Gorgeous chair. Arrived fast, however it was a bit darker than the pictures and is uncomfortable. Seat cushion is hard as a rock. When you sit down it’s like your sitting on the chair not in it. The blush is a bit darker than pictured, which I am okay with (more of a dusty rose?). As another reviewer mentioned, it's not very comfortable. I have to see if it's because it needs to be 'broken in' or if it's just the shape/materials that won't allow you to get comfy/hug your body. I noticed when I get up the chair lifts and is a little wobbly. For the price, it's aesthetically very pleasing but doesn't quite hit the mark with comfort. Not enough reasons for me to return so I'm sticking with it because it really looks nice with all my other furniture pieces. Assembly was a breeze! Im still give to the chair 5 starts because they are beautiful ! 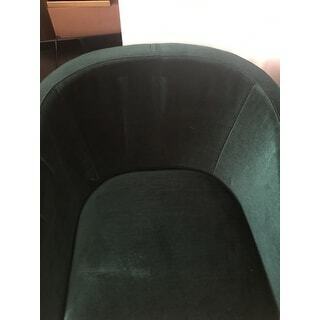 But one of the chair arrive with a huge scratch on the legs and the screw messing! I guess is the carrier fault ! Thank Overstock for this amazing product! Obsessed. Color is much better in person, it looks a little too peachy in product photo, I find it more of a rose coral color in person. Worth the price. I have two in my office, they are very comfortable and hold up very well. "Can I order a fabric sample?" Unfortunately no, we don't have a fabric sample for this. What color is the navy blue? As the review above says it’s not navy blue?